Little, Brown and Company, 9780316264150, 304pp. From Pulitzer Prize-­winning journalist David Wood, a battlefield view of moral injury, the signature wound of America's 21st century wars. Most Americans are now familiar with Post Traumatic Stress Disorder (PTSD) and its prevalence among troops. In this groundbreaking new book, David Wood examines the far more pervasive yet less understood experience of those we send to war: moral injury, the violation of our fundamental values of right and wrong that so often occurs in the impossible moral dilemmas of modern conflict. 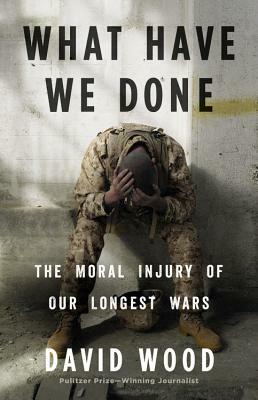 Featuring portraits of combat veterans and leading mental health researchers, along with Wood's personal observations of war and the young Americans deployed in Iraq and Afghanistan, WHAT HAVE WE DONE offers an unflinching look at war and those who volunteer for it: the thrill and pride of service and, too often, the scars of moral injury. Impeccably researched and deeply personal, WHAT HAVE WE DONE is a compassionate, finely drawn study of modern war and those caught up in it. It is a call to acknowledge our newest generation of veterans by listening intently to them and absorbing their stories; and, as new wars approach, to ponder the inevitable human costs of putting American "boots on the ground." David Wood, a veteran war reporter, is a staff correspondent for the Huffington Post, where he won the 2012 Pulitzer Prize for national reporting on severely wounded warriors. A birthright Quaker and raised as a pacifist, Wood has spent more than thirty years covering the U.S. military and conflicts around the world, most recently in extended deployments embedded with American troops in Iraq and Afghanistan. "With What Have We Done David Wood has written what may be one of the best, most riveting and accessible presentations on moral injury and how it differs from Post-traumatic Stress Disorder (PTSD)....David Wood is a major voice moving moral, ethical and spiritual dimensions front and center in understanding and helping our warriors. "—Edward Tick, PhD, author of War and the Soul and Warrior's Return, co-founder and director of Soldier's Heart, Inc.
"What Have We Done is a landmark effort. Extraordinary work, and exceptional treatment of a strange, damaging phenomenon. We cannot begin to solve the problem until it's properly identified. Perhaps now we can begin to heal. Bravo!" "David Wood is a treasure--a defense reporter who is both knowledgeable and morally perceptive. Plus, he can write. Read this and you will learn about our soldiers, our wars, and even the times in which we live. If I could, every time I heard someone thank someone else 'for their service,' I'd give both parties a copy of this book." "Wood has brilliantly articulated the harsh and lasting realities of the moral injury from Iraq and Afghanistan for so many who fought and served honorably. He uses his own, vivid memories of war, and the haunting memories of those who fought our wars to 'pressurize the soul' of America, urging all of us to deal with this almost universally ignored injury of the heart and soul. Heartbreaking and compelling!" "David Wood is the best of the best. He gets out in the dust and mud and danger with the troops, and they revere him--which I know from them directly. Tissues at the ready! You will weep."